The game of “Spoting the Difference" starts again! Google’s ICP license renewed. See the captured today’s Google.cn web page below (left), and compare it with the page in last week (right). Exactly as what I predicted, Google is trying to make Google.cn being a non-search engine website. It now places "Music", "Translation" and "Shopping" at the web page. These are what Google wishes to keep on running in China. 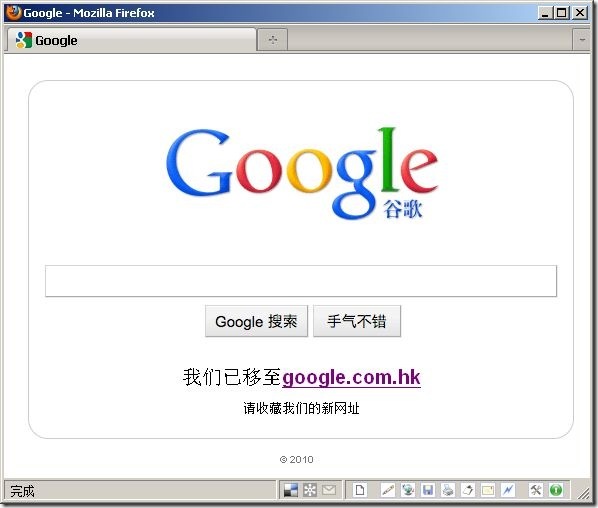 While the search engine service of Google.cn is replaced by a link to google.com.hk. Legally speaking, Google.cn is not providing search engine service currently. It is merely a link to another website. Just like the links added in any of our own web posts. Interestingly, please pay attention to those minor changes. It seems Google’s lawyers are demonstrating their legal skills. For example, in the 4 July version, it says "we have moved to (我们已经移至) google.com.hk", while in current page, "we have moved to" has been moved. Why? I assume the reason might be: The sentence "WE have moved to" acknowledged that the one who runs "google.com.hk" is identically the same one who runs "google.cn". In that circumstance, Google.cn would still be critisized by Chinee authority on providing searching results including "illegal" materials. Without such sentence, when it is accused by the government, Google China may say that it is an independent legal entity who is distinctive from the operator of google.com.hk. Besides the censorship topic. Let’s discuss something about intellectual property law (this might be more interesting): Is there any difference between providing a link to a search engine and providing a search engine service per se? When you place a link to a web page. You will not be a service provider, therefore you will not be liable for the copyright/trademark infringement even when the linked page is full of infringing materials. If a right owner wants your money, he/she at least has to send you a notice saying "hey! The web page you are linking is full of my proprietary stuff. Please move that hyperlink!" After you recieved such letter, in China, you may have to remove the link if there is really infringing contents at the web page you are linking to. However, now in the Google’s circumstance, this will no be a problem because google.cn is linking to google.com.hk, which is owned by google.cn’s parent company. In short, by replacing search box with a hyperlink to google.com.hk, Google.cn may escape from being accused for vicarious liability, which is by far a "killing application" of the intellectual property holders in this era of the Cambrian explosion of the Internet. Note: Any views or opinions presented in this post are solely those of the author, and do not necessarily represent those of the author’s employer. Promulgated by the National Copyright Administration and the Ministry of Information Industry on 29 April 2005 and effective as of 30 May 2005 (Order No. 5, 2005). Article 1　These Procedures have been formulated in accordance with the PRC, Copyright Law and the relevant laws and administrative regulations in order to strengthen the administrative protection of the right of transmission on information networks in internet information services and to standardize administrative enforcement acts. Article 2　These Procedures shall apply to functions such as uploading, storing, linking or searching of the contents of works or audio and video products that are provided automatically on the internet in internet information services according to the commands of an internet content provider, without any editing, revision or selection of the stored or transmitted contents. Where internet contents are directly provided in internet information services, the Copyright Law shall apply. For the purposes of these Procedures, an “internet content provider” is an online user that publishes the relevant contents on the internet. Article 3　Copyright administrative departments at all levels shall carry out administrative protection of the right of transmission on information networks in internet information services in accordance with laws, administrative regulations and these Procedures. The State Council department in charge of information industry and the telecommunications administrative authorities of each province, autonomous region and municipality directly under the central government shall cooperate with such work in accordance with the law. Article 4　The administrative penalties imposed by copyright administrative departments for infringement of the right of transmission on information networks in internet information services shall be governed by the Administrative Penalties in Connection with Copyright Implementing Procedures. Infringement of the right of transmission on information networks in internet information services shall be governed by the copyright administrative department at the place of infringement. Places of infringement shall include the place in which equipment such as servers used to provide the internet information services specified in Article 2 hereof is located. Article 5　If a copyright holder discovers that his copyright is infringed by content disseminated on the internet and issues a notice to the internet content provider or any other institution it entrusts （hereafter collectively referred to as the “internet information service provider”）, the internet information service provider shall immediately take actions to remove the relevant content and keep the notice of the copyright holder for six months. Article 6　Upon receipt of the notice of the copyright holder, the internet information service provider shall record the content of the information provided and the time of publication, and the internet address or domain name used for publishing such information. The internet access service provider shall record the information of the internet content provider such as the access time, user account, internet address or domain name and the calling telephone number. The record referred to in the preceding paragraph shall be kept for 60 days and shall be provided upon inquiry by the copyright administrative department. Article 7　If the internet information service provider removes the relevant content pursuant to the notice of the copyright holder, the internet content provider may issue to both the internet information service provider and the copyright holder a counter notice stating that the removed content does not infringe the copyright. Upon the issuance of such counter notice, the internet information service provider may immediately restore the removed content without administrative or legal liability for such restoration. 5. declaration of truthfulness of the contents of the notice. 4. declaration of truthfulness of the contents of the counter notice. Article 10　The notice of the copyright holder and the counter notice of the internet content provider shall be in writing. The notice of the copyright holder and the counter notice of the internet content provider shall be deemed not to have been issued if they do not contain the contents specified in Article 8 or Article 9 hereof. 2. impose a fine of not more than three times the turnover from illegal business, or a fine not of more than Rmb 100,000 if it is difficult to calculate the turnover from illegal business. Article 12　If there is no evidence indicating that an internet information service provider is fully aware of the existence of the infringement or if it takes actions to remove the relevant content upon receipt of the notice of the copyright holder, it shall not bear administrative or legal liability. Article 13　When investigating and handling a case of infringement on the right of transmission on information networks in internet information services, the copyright administrative department may require the copyright holder to provide the necessary materials according to Article 12 of the Administrative Penalties in Connection with Copyright Implementing Procedures, as well as the notice it issues to the internet information service provider and the proof of failure of such internet information service provider to take actions to remove the relevant content. Article 14　If an internet information service provider commits an act specified in Article 11 hereof and is determined by the copyright administrative department in accordance with the law as specializing in copyright piracy activities, or there are other serious circumstances, the case shall be handled by the State Council department in charge of information industry or the telecommunications administrative authority of the province, autonomous region or municipality directly under the central government in accordance with the relevant laws and administrative regulations. The internet access service provider shall cooperate with the implementation of corresponding handling measures pursuant to the notice of the State Council department in charge of information industry or the telecommunications administration authority of the province, autonomous region or municipality directly under the central government. Article 15　If an internet information service provider fails to perform its obligations according to Article 6 hereof, the State Council department in charge of information industry or the telecommunications administrative authority of the province, autonomous region or municipality directly under the central government shall issue a warning and may also impose a fine of not more than Rmb 30,000. Article 16　If, in the course of investigating and handling a case of infringement on the right of transmission on information networks in internet information services, the copyright administrative department discovers that the act of the internet information service provider is suspected to have constituted a criminal offence, it shall, pursuant to the State Council, Transfer of Suspected Criminal Cases from Administrative Enforcement Authority Provisions, transfer the case to the judicial authority for pursuit of criminal liability in accordance with the law. Article 17　These Procedures shall apply to the administrative protection of the rights of holders of copyright-related right, such as performers and producers of audio and video products, to disseminate their performance or their audio and video products to the public on the internet. Article 18　The National Copyright Administration and the Ministry of Information Industry shall be responsible for interpreting these Procedures. Article 19 These Procedures shall be implemented as of 30 May 2005. NOTE: Please DO NOT quote this text for current legal cases because it has been amended tremendously twice by the 2001 Amendment of Copyright Law and the 2010 Amendment of Copyright Law. I republish it hereby merely for the purpose of historical ressearch. Law adopted at the Fifteenth Session of the Standing Committee of the Seventh National People’s Congress on September 7, 1990. Article 1.This Law is enacted, in accordance with the Constitution, for the purposes of protecting the copyright of authors in their literary, artistic and scientific works and the rights related to copyright, of encouraging the creation and dissemination of works which would contribute to the construction of socialist spiritual and material civilization, and of promoting the development and flourishing of socialist culture and sciences. Article 2.Works of Chinese citizens, legal entities or entities without legal personality, whether published or not, shall enjoy copyright in accordance with this Law. Works of foreigners first published in the territory of the People’s Republic of China shall enjoy copyright in accordance with this Law. Any work of a foreigner published outside the territory of the People’s Republic of China which is eligible to enjoy copyright under an agreement concluded between the country to which the foreigner belongs and China, or under an international treaty to which both countries are party, shall be protected in accordance with this Law. * Quyi refers to such traditional art forms as ballad singing, story telling, comic dialogues, clapper talks and cross talks (translator’s note). (9) other works as provided for in laws and administrative regulations. Article 4.Works the publication or distribution of which is prohibited by law shall not be protected by this Law. Copyright owners, in exercising their copyright, shall not violate the Constitution or laws or prejudice the public interest. (3) calendars, numerical tables, forms of general use and formulas. Article 6.Regulations for the protection of copyright in expressions of folklore shall be established separately by the State Council. Article 7.Where any scientific or technological work is protected under the Patent Law, the Law on Technology Contracts or similar laws, the provisions of those laws shall apply. Article 8.The copyright administration department under the State Council shall be responsible for the nationwide administration of copyright. The copyright administration department of the People’s Government of each province, autonomous region and municipality directly under the Central Government shall be responsible for the administration of copyright in its administrative area. (2) other citizens, legal entities and entities without legal personality enjoying copyright in accordance with this Law. (5) the right of exploitation and the right to remuneration, that is, the right of exploiting one’s work by reproduction, live performance, broadcasting, exhibition, distribution, making cinematographic, television or video production, adaptation, translation, annotation, compilation and the like, and the right of authorizing others to exploit one’s work by the above-mentioned means and of receiving remuneration therefor. Article 11.Except where otherwise provided in this Law, the copyright in a work shall belong to its author. The author of a work is the citizen who has created the work . Where a work is created according to the intention and under the supervision and responsibility of a legal entity or entity without legal personality, such legal entity or entity without legal personality shall be deemed to be the author of the work. The citizen, legal entity or entity without legal personality whose name is mentioned in connection with a work shall, in the absence of proof to the contrary, be deemed to be the author of the work . Article 12.Where a work is created by adaptation, translation, annotation or arrangement of a preexisting work, the copyright in the work thus created shall be enjoyed by the adapter, translator, annotator or arranger, provided that the exercise of such copyright shall not prejudice the copyright in the original work. Article 13.Where a work is created jointly by two or more coauthors, the copyright in the work shall be enjoyed jointly by those coauthors. Coauthorship may not be claimed by anyone who has not participated in the creation of the work . If a work of joint authorship can be separated into independent parts and exploited separately, each coauthor shall be entitled to independent copyright in the parts that he has created, provided that the exercise of such copyright shall not prejudice the copyright in the joint work as a whole. Article 14.The copyright in a work created by compilation shall be enjoyed by the compiler, provided that the exercise of such copyright shall not prejudice the copyright in the preexisting works included in the compilation. The authors of such works included in a compilation as can be exploited separately shall be entitled to exercise their copyright in their works independently. Article 15.The director, scriptwriter, lyricist, composer, cameraman and other authors of a cinematographic, television or videographic work shall enjoy the right of authorship in the work, while the other rights included in the copyright shall be enjoyed by the producer of the work. The authors of the screenplay, musical works and other works that are included in a cinematographic, television or videographic work and can be exploited separately shall be entitled to exercise their copyright independently. Article 16.A work created by a citizen in the fulfillment of tasks assigned to him by a legal entity or entity without legal personality shall be deemed to be a work created in the course of employment. The copyright in such work shall be enjoyed by the author, subject to the provisions of the second paragraph of this Article, provided that the legal entity or entity without legal personality shall have a priority right to exploit the work within the scope of its professional activities. During the two years after the completion of the work, the author shall not, without the consent of the legal entity or entity without legal personality, authorize a third party to exploit the work in the same way as the legal entity or entity without legal personality does. (2) works created in the course of employment where the copyright is, in accordance with laws, administrative regulations or contracts, enjoyed by the legal entity or entity without legal personality. Article 17.The ownership of the copyright in a commissioned work shall be agreed upon in a contract between the commissioning and the commissioned parties. In the absence of a contract or of an explicit agreement in the contract, the copyright in such a work shall belong to the commissioned party. Article 18.The transfer of ownership of the original copy of a work of fine art, or other works, shall not be deemed to include the transfer of the copyright in such work, provided that the right to exhibit the original copy of a work of fine art shall be enjoyed by the owner of such original copy. Article 19.Where the copyright in a work belongs to a citizen, the right of exploitation and the right to remuneration in respect of the work shall, after his death, during the term of protection provided for in this Law, be transferred in accordance with the provisions of the Inheritance Law. Where the copyright in a work belongs to a legal entity or entity without legal personality, the right of exploitation and the right to remuneration shall, after the change or the termination of the status of the legal entity or entity without legal personality, during the term of protection provided for in this Law, be enjoyed by the succeeding legal entity or entity without legal personality which has taken over the former’s rights and obligations, or, in the absence of such successor entity, by the State. Article 20.The rights of authorship, alteration and integrity of an author shall be unlimited in time. Article 21.The term of protection of the right of publication, the right of exploitation and the right to remuneration in respect of a work of a citizen shall be the lifetime of the author and fifty years after his death, expiring on December 31 of the fiftieth year after his death. In the case of a work of joint authorship, such term shall expire on December 31 of the fiftieth year after the death of the last surviving author. The term of protection of the right of publication, the right of exploitation and the right to remuneration in respect of a work where the copyright belongs to a legal entity or entity without legal personality, or in respect of a work created in the course of employment where the legalentity or entity without legal personality enjoys the copyright (except the right of authorship), shall be fifty years, expiring on December 31 of the fiftieth year after the first publication of such work, provided that any such work that has not been published within fifty years after the completion of its creation shall no longer be protected under this Law. The term of protection of the right of publication, the right of exploitation and the right to remuneration in respect of a cinematographic, television, videographic or photographic work shall be fifty years, expiring on December 31 of the fiftieth year after the first publication of such work, provided that any such work that has not been published within fifty years after the completion of its creation shall no longer be protected under this Law. (12) transliteration of a published work into braille and publication of the work so transliterated. The above limitations on rights shall be applicable also to the rights of publishers, performers, producers of sound recordings and video recordings, radio stations and television stations. Article 23.Subject to provisions in this Law according to which no permission is needed, anyone who exploits a work created by others shall conclude a contract with, or otherwise obtain permission from, the copyright owner. (6) any other matter that the contracting parties consider necessary. Article 25.The licensee shall not, without permission from the copyright owner, exercise any right that the copyright owner has not expressly licensed in the contract. Article 26.The term of validity of a contract shall not exceed ten years. The contract may be renewed on expiration of that term. Article 27.The tariffs for remuneration for the exploitation of works shall be established by the copyright administration department under the State Council in collaboration with other departments concerned. Where otherwise agreed to in a contract, remuneration may also be paid in accordance with the terms of the said contract. Article 28.Publishers, performers, producers of sound recordings and video recordings, radio stations, television stations and other entities who or which have obtained, pursuant to this Law, the right to exploit the copyright of others, shall not infringe the authors’ rights of authorship, alteration or integrity, or their right to remuneration. Article 29.A book publisher who publishes a book shall conclude a publishing contract with, and pay remuneration to, the copyright owner. Article 30.During the term of the contract, a book publisher shall have the exclusive right to publish the work delivered to him by the copyright owner for publication. The term of the exclusive right to publish, enjoyed by the publisher as specified in the contract, shall not exceed ten years. The contract may be renewed on expiration. During the term specified in the contract, the exclusive right to publish a work enjoyed by the book publisher shall be protected by law, and the work may not be published by others. Article 31.The copyright owner shall deliver the work within the term specified in the contract. The book publisher shall publish the work in accordance with the quality requirements and within the term specified in the contract. The book publisher shall bear the civil liability specified in Article 47 of this Law if he fails to publish the work within the term specified in the contract. The book publisher shall notify, and pay remuneration to, the copyright owner when the work is to be reprinted or republished. If the publisher refuses to reprint or republish the work when stocks of the book are exhausted, the copyright owner shall have the right to terminate the contract. Article 32.Where a copyright owner has submitted the manuscript of his work to a newspaper or a periodical publisher for publication and has not received, within 15 days from the newspaper publisher or within 30 days from the periodical publisher, counted from the date of submission of the manuscript, any notification of the said publisher’s decision to publish the work, the copyright owner may submit the manuscript of the same work to another newspaper or periodical publisher for publication, unless the two parties have agreed otherwise. Except where the copyright owner has declared that reprinting or excerpting is not permitted, other newspaper or periodical publishers may, after the publication of the work by a newspaper or periodical, reprint the work or print an abstract of it or print it as reference material, but such other publishers shall pay remuneration to the copyright owner as prescribed in regulations. Article 33.A book publisher may alter or abridge a work with the permission of the copyright owner. A newspaper or periodical publisher may make editorial modifications and abridgments in a work, but shall not make modifications in the content of the work unless permission has been obtained from the author. Article 34.When publishing works created by adaptation, translation, annotation, arrangement or compilation of preexisting works, the publisher shall pay remuneration both to the owners of the copyright in the works created by means of adaptation, translation, annotation, arrangement or compilation and to the owners of the copyright in the original works. Article 35.A performer (an individual performer or a performing group) who for a performance exploits an unpublished work created by another shall obtain permission from, and pay remuneration to, the copyright owner. A performer who for a commercial performance exploits a published work created by another does not need permission from, but shall, as prescribed by regulations, pay remuneration to, the copyright owner; such work shall not be exploited where the copyright owner has declared that such exploitation is not permitted. A performer who for a commercial performance exploits a work created by adaptation, translation, annotation or arrangement of a preexisting work shall pay remuneration both to the owner of the copyright in the work created by adaptation, translation, annotation or arrangement and to the owner of the copyright in the original work. Where a performer performs a work created by another and that performance is exploited for the production of a sound recording, video recording, radio program or television program, Article 37 and Article 40 shall apply. (4) to authorize others to make sound recordings and video recordings for commercial purposes, and to receive remuneration therefor. Article 37.A producer of sound recordings who, for the production of a sound recording, exploits an unpublished work created by another, shall obtain permission from, and pay remuneration to, the copyright owner. A producer of sound recordings who, for the production of a sound recording, exploits a published work created by another, does not need permission from, but shall, as prescribed by regulations, pay remuneration to, the copyright owner; such work shall not be exploited where the copyright owner has declared that such exploitation is not permitted. A producer of video recordings who, for the production of a video recording, exploits a work created by another shall obtain permission from, and pay remuneration to, the copyright owner. A producer of sound recordings or video recordings who exploits a work created by adaptation, translation, annotation or arrangement of a preexisting work shall pay remuneration both to the owner of the copyright in the work created by adaptation, translation, annotation or arrangement and to the owner of the copyright in the original work. Article 38.When producing a sound recording or video recording, the producer shall conclude a contract with, and pay remuneration to, the performers. Article 39.A producer of sound recordings or video recordings shall have the right to authorize others to reproduce and distribute such sound recordings or video recordings and the right to obtain remuneration therefor. The term of protection of such rights shall be fifty years, expiring on December 31 of the fiftieth year after the first publication of the recording. A producer of sound recordings or video recordings who is authorized to reproduce and distribute a sound recording or video recording shall also pay remuneration to the copyright owner and to the performer as prescribed by regulations. Article 40.A radio station or television station that exploits, for the production of a radio or television program, an unpublished work created by another, shall obtain permission from, and pay remuneration to, the copyright owner. A radio station or television station that exploits, for the production of a radio or television program, a published work created by another does not need a permission from the copyright owner, but such a work shall not be exploited where the copyright owner has declared that such exploitation is not permitted. In addition, remuneration shall be paid as prescribed by regulations unless this Law provides that no remuneration need to be paid. A radio station or television station that exploits, for the production of a radio or television program, a work created by adaptation, translation, annotation or arrangement of a preexisting work, shall pay remuneration both to the owner of the copyright in the work created by adaptation, translation, annotation or arrangement and to the owner of the copyright in the original work. Article 41.When producing a radio program or television program, the radio station or television station shall conclude a contract with, and pay remuneration to, the performers. (3) to authorize others to reproduce and distribute the radio or television program, and to receive remuneration therefor. The term of protection of the rights specified in the preceding paragraph shall be fifty years, expiring on December 31 of the fiftieth year after the first broadcasting of the program . A producer of sound recordings or video recordings who is authorized to reproduce and distribute a radio or television program shall also pay remuneration to the copyright owner and to the performer as prescribed by regulations. Article 43.A radio station or television station that broadcasts, for non-commercial purposes, a published sound recording needs not obtain permission from, or pay remuneration to, the copyright owner, performer or producer of the sound recording. Article 44.A television station that broadcasts a cinematographic, television or videographic work produced by another shall obtain permission from, and pay remuneration to, the producer of the cinematographic, television or videographic work. (8) committing other acts of infringement of copyright and of other rights related to copyright. (7) producing or selling a work of fine art where the signature of an artist is counterfeited. Article 47.A party who fails to fulfill his contractual obligations, or executes them in a manner that is not in conformity with the agreed conditions of the contract, shall bear civil liability in accordance with the relevant provisions of the General Principles of the Civil Law. Article 48.A dispute over copyright infringement may be settled by mediation. If mediation is unsuccessful, or if one of the parties fails to carry out an agreement reached by mediation, proceedings may be instituted in a people’s court. Proceedings may also be instituted directly in a people’s court if the parties do not wish to settle the dispute by mediation. Article 49.A dispute over a copyright contract may be settled by mediation. It may also be submitted for arbitration to a copyright arbitration body under the arbitration clause in the contract, or under a written arbitration agreement concluded after the contract has been signed. The parties shall implement the arbitration award. If one of the parties fails to implement the award, the other party may apply to a people’s court for enforcement. If the people’s court that has been requested to enforce an arbitration award finds the award unlawful, it shall have the right to refuse the enforcement. If a people’s court refuses to enforce an arbitration award, the parties may institute proceedings concerning the contractual dispute in a people’s court . Any party may institute proceedings directly in a people’s court in the absence of an arbitration clause in the contract or in the absence of a written arbitration agreement concluded after the contract has been signed. Article 50.Any party who objects to an administrative penalty may institute proceedings in a people’s court within three months of having received the written decision on the penalty. If a party neither institutes proceedings nor implements the decision within the above time limit, the copyright administration department concerned may apply to a people’s court for enforcement. Article 51.For the purposes of this Law, the terms "zhuzuoquan*" and "banquan*" are synonymous. * Zhuzuoquan corresponds to "author’s right," but literally translated means "right in a work"; banquan is the literal translation of "copyright." This Article has been included in the Law as both expressions are used in Chinese. Article 52.The term "reproduction" as used in this Law shall mean the act of producing one or more copies of a work by printing, photocopying, copying, lithographing, making a sound recording or video recording, duplicating a recording, or duplicating a photographic work, or by other means. The term "reproduction" as used in this Law shall not cover the construction or the manufacture of industrial products on the basis of drawings of engineering designs and product designs, and descriptions thereof. Article 53.Regulations for the protection of computer software shall be established separately by the State Council. Article 54.The implementing regulations of this Law shall be drawn up by the copyright administration department under the State Council and implemented on approval by the State Council. Article 55.The rights of copyright owners, publishers, performers, producers of sound recordings and video recordings, radio stations and television stations as provided for in this Law, of which the term of protection specified in this Law has not yet expired on the date of this Law’s entry into force, shall be protected in accordance with this Law. Any infringements of copyright and the rights related to copyright or breaches of contract committed prior to the entry into force of this Law shall be dealt with under the relevant regulations or policies in force at the time when the act was committed. Article 56.This Law shall enter into force on June 1, 1991. Judicial Mediation – A Deprofessionalization? ON 15 AND 16 APRIL 2009, CityU of HK Law School held an international conference on the mediation. Experts from China, Hong Kong, Australia and Macau presented their latest academic outputs in the meeting. The interesting thing is: Most Chinese experts are focusing on the judicial mediation, which is the mediation coordinated, and in many circumstances initiated, by judges during the litigations. Experts in other jurisdictions, by contrary, tends to discuss the mediation out of the court. China’s judiciary system is actually now experiencing a new wave of transformation. Contrary to the trend before 2007, the current path of the "judicial reform" is to make the judiciary more "close to people". One of the core measures is to enhance the "judicial mediation". In my view, if the "profesionalization is a world trend for the mediation" (stated by Professor Nadja Alexander, a prominent expert in the arena of mediation), then the emphasizing of the "judicial mediation" in Chinese courts can be named a trend of de-professionalization of the litigation. In a lunch seminar a week later from the conference, Mr. WU Zhi, an Asso. professor from Hunan Normal University brought his interesating talk about the "the mediation in Chinese IP litigations" in CityU. His presentation proved again my assumption. In resent three years, Chinese judiciary system has issued a good many of documents on the policies of the mediation. Now the Supreme People’s Courts seems stressed the mediation as the preference in the dispute resolution. The most interesting thing in prof. Wu’s seminar is the discussion among auditors. Most of auditors are the students who registered in CityU’s creative LLM program for mainland judges. Because they are judges on the mainland China, they have many experiences in those judcial mediation. This makes the discussion being exciting. As a real auditor, I do obtain many useful knowledges and inpirations. One of the most impressive inspiration is: why the Chinese courts eager to be mediation centers? Two judges answered this question respectively (one was in the seminar and the other was on his way back to the dorm together with me, and their answers are amazingly identical! ): because the China’s courts are aiming at providing dispute solutions rather than the justice. This reminds me a precedent post in this blog on the "mission of the Supreme People’s Courts" (in Chinese). Yes, the Chinese courts are not set as a seperation of sovereignty powers but the institution for dispute resolution authorized by the people’s congress (at least in the Constitution literarily). The Constitution and Laws are just one of the "three supremacies" (the slogan of the supreme court – and a question in 2008 China Bar exam). As a layman either in the mediation or in the procedure law. I cannot figure out whether this "deprofessionalization" is good or bad in an acedemic way. The only thing raised in my mind is: the conflict among dispute resolution mechanisms. Mediation is a more efficient way in resolving the disputes than litigation, while the feature of the litigation is it’s formal procedure which may be costly but guarantted the rule of law. When the judicary simplified its procedure and compete to the unformal (or less-formal) mechanism of dispute resolution, it actually retreated itself from the position of "transporting justice". And its status will be conflict to the existing mediation institutions. How many cost will be paid in this institutional competition? Another interesting topic in is: whether the IP litigation can really be deprofessionlized in the judicial mediation – even if we narrow the aim of the courts only at efficient dispute resolution? Let’s leave this question in the next thread. Abstract: This article reviews the copyright dilemma of illegal works in the context of Chinese copyright system. Under the current law, not merely the works with illegal content, but also the works did not fulfill the procedural requirement will be denied the copyright protection. Article 4(1) may find legitimacy in the domestic level, but does not comply with the WTO law. The three criteria in Article 13 of TRIPS Agreement can be applied to examine Article 4(1). The key problem lies in the uncertainty of the scope of denial of copyright. This leads to the Super-national Treatment. Based on these analyses, the last part of the article proposed some suggestions for the future legal reform.